An inexpensive annual inspection, test and servicing of your wells and pumps is the best insurance you can have for your irrigation system. Your water supply is precious. You have made a substantial investment by drilling wells and purchasing the pumping equipment that suits your needs. 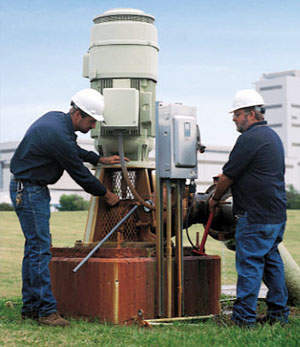 Over a period of time, your wells and pumps may no longer perform as designed. Peerless Midwest, Inc. can restore your water supply to its original design capacity and insure it is in top operation condition. Your irrigation system is one area where an ounce of prevention is worth a pound of cure. Preventative maintenance will provide significant savings in both cost and downtime. State law requires all existing fire pumps to be tested annually. Your insurance company will also want to see you keep your pump and equipment in good condition. Our firm specializes in the complete inspection, testing and repair of all components of your fire pump system. In addition to the standard testing, we also highly recommend performing preventative maintenance on the system. Performing basic, preventative maintenance such as oil and filter changes, packing changes and cleaning out drain lines will maximize the service life of your system. The Fire Pump is the most critical component of your fire sprinkler system. Properly maintaining your pump is necessary to insure it performs when you need it most. Choosing the right contractor to maintain your fire pump is the first step towards achieving your goal of protecting life and property. foremen are experienced with all types of UL/FM Diesel Engines. It only makes sense to hire one knowledgeable contractor who can handle the required annual maintenance of the engine, pump, controllers and water supply in one trip. Keeping your engine in good running order is equally as important as keeping the pump in good shape! motor services to solve any motor problem.